The Q-series is a very versatile, dynamic and high performance loudspeaker audio system, made in Germany by d&b audiotechnik and available as first choice in our equipment stock. It consists of the Q1, the Q7, the Q10 & the Q-SUB. Each model has its own particular features and advantages, considering location and circumstance. The d&b loudspeaker system is powered by d&b amplifier models D12 and D80, which we incorporate in our hire rental packages – see below for an in-depth look. The Q1 is a line array loudspeaker for use in vertical columns giving a 75° constant directivity dispersion pattern in the horizontal plane. The Q1 cabinet is a passive 2-way design that houses 2 × 10″ LF drivers and a 1.3″ HF compression driver with a toroidal wave shaping device to achieve a 75° × 15° (h × v) dispersion characteristic. The two 10″ neodymium LF drivers are positioned in a dipolar arrangement providing an exceptional dispersion control even at lower frequencies, with the 75° nominal dispersion angle being maintained down to 400Hz. 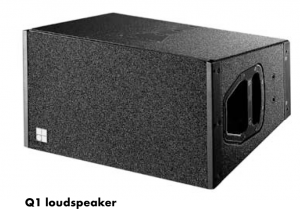 Q1 cabinets can be combined with the Q subwoofer system; in line array set ups with the Q-SUB flown on top of the array or as a separate column, or in ground stacked applications where the Q-SUB also mechanically supports the Q1s. The Q-SUB extends the system frequency response to below 40Hz, for further extension of bandwidth and headroom ground stacked B2 subwoofers can be used (driven in INFRA mode). The Q1 cabinet is constructed from marine plywood and has an impact resistant paint finish. The front of the loudspeaker cabinet is protected by a rigid metal grill covered with a replaceable acoustically transparent foam. The cabinet incorporates a pair of handles and mounted on the rear panel are two EP5 connectors wired in parallel. The Q7 and Q10 loudspeakers use a 1.3″ HF driver fitted to rotatable 75° ×40° and 110° × 40° (h × v) constant directivity horns allowing them to be configured for use both vertically or horizontally. When deployed upright, the Q7 and Q10 are accurate stand-alone full range loudspeakers with vertical directivity control extending approximately one octave below similarly sized biaxial loudspeakers. The Q-SUB cabinet completes the Series sharing the same width as the other three loudspeakers and has compatible flying fittings enabling its use at the top of columns with other Q-Series loudspeakers. The Q-SUB is a bass-reflex design with an 18″ high excursion driver and uses d&b SenseDrive technology when driven by the D12 amplifier. Q-SUBs can be combined to produce Cardioid Subwoofer Array performance when the CSA mode is selected in the D12. To complete the system, there’s no better choice than the dual/quad channel amplifiers D12 & D80. They provide two different power ranges, incorporate d&b loudspeaker specific configuration information, including the Q-Series loudspeakers and have analog and digital signal inputs and links. These devices are specially designed and manufactured by d&b utilizing Digital Signal Processing and include switchable functions for precisely tailoring system response for a wide variety of applications. A user definable 4-band parametric equalizer and a delay capability is provided in every amplifier channel to reduce the need for external processing devices. The D12 amplifier additionally offers a 2-Way Active mode and a mixed TOP/SUB output configuration, output connector options as well as d&b SenseDrive. 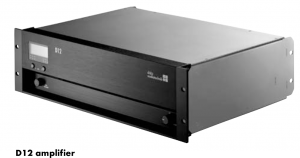 Both amplifiers have d&b Remote network interfaces enabling control and monitoring of a large number of system functions and extensive system integration capabilities. d&b Load monitoring and System check are also incorporated to remotely monitor loudspeaker driver status. The d&b Q-series and amplifiers can be hired from our Chaps PA audio service, based in the Surrey and London area, choosing from different packages to provide a professional experience at your event. We offer custom sound solutions considering your needs, from small to large situations covering all areas of the the music industry. Our PA system has been used at many prestigious venues as per the following list : Abbey Road Studios, One Mayfair London, The American Embassy Residence, One Marylebone, Battersea Evolution, Trafalgar square, The Royal Academy of Arts, ICA (The Mall), Billingsgate Fish market, The Shard, County Hall, 34 Mayfair, Hard rock Cafe, Hilton Park Lane Hotel, Dorchester Hotel, Annabel’s, Shoreditch Town Hall, Shoreditch Red Gallery, Kingston Hippodrome, Langham Hotel, Millennium Gloucester Hotel, Copthorne Tara Hotel Kensington, St. Pancras Renaissance Hotel, St. John’s Hyde Park, Regent’s Park – Open air Theatre, The South Bank (Bernie Spain Garden), Pinewood Studios, Maida Vale and finally The Tabernacle. Contact us for further information and a free no-obligation quote at our contact page.